Firstly apologies for the lateness of this posting.... again I've managed to slip behind without actually realising it. Where does the time go? Yes, I've been working hard at pulling TWO LIVES into some sort of shape but I've also discovered the distraction of MYSPACE and FACEBOOK. The most wonderful displacment activities ever. I find myself spending hours looking for new 'friends' to add to my pages and eagerly awaiting requests from others to join my page. It is all just so exciting, I LOVE THE INTERNET! I'm currently reading Karin Slaughter's TRIPTYCH. Very engrossig read. Hard to say I'm enjoying it as such because its really quite gory but its interesting to see the storyline develop. She's very good! I'm having to limit myself to how long I read for else I wouldn't put it down until the end. Next weekend is the Conference of the Romantic Novelists Association which I am attending for educational purposes only. It has nothing to do with juvenile kitchen parties in the student accommodations or three meals a days cooked by someone else or leisurely evenings in the bar! I do jest a little, its alway a very stimulating conference with interesting speakers and sessions and I can't wait. So many friends are going also. Short and sweet this week but after the conference I shall be back on form! I hope. Well, I survived the Southern Writers Conference in Earnley (near Chichester). It was a great weekend and even the M25 behaved this year which can only be a bonus. Its a wonderful setting near the sea with acres of gardens and very beautiful but oh so noisy peacocks. The weather was good and it was sooooo relaxing. I love the social side of the conferences, sitting around in the gardens chatting while someone else cooks gorgeous meals! WILL RANDALL who is not so much a travel writer as a traveller who writes about it humorously afterwards, if you see what I mean. Very interesting and amusing and tells a good tale! So, after a fun weekend of great food, a cheap bar and much good company, it's back to a chunk of hard work before the RNA conference in Leicester next month. I have however now discovered more work displacement activity in the form of MySpace and Facebook. I know it was originally for kids but now we grown ups are asserting our right to use it! I've discovered loads of authors on there, even my favourite Harlan Coben has a page on MySpace. Now I have to be organised and limit my time on-line! I could easily play around all day.... and to think I couldn't understand why anyone would want to use the internet! 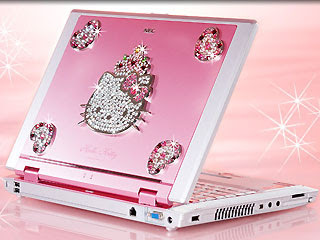 Because I really could not get to grips with the attractive Apple laptop (the replacment for the one chav-cat smashed up) I've just bought a new very pretty pink laptop. All small and pale pink and girly; however I now know that next year it will be obsolete when I am able to get my hands on this very very very gorgeous Hello Kitty machine. Oh my.......... Is this not truly fabulous? I am preparing my Christmas list as we speak. Now I am going to work. JOKE. Why does the Elephant have Big Ears? Because Noddy wouldn't pay the Ransom! Boo boom! Orchids, Conferences, this and that! 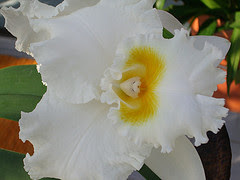 How do like this orchid? Very pretty, dainty and also unusual don't you think? Believe it or not, it called 'Bernadine Kennedy'! Popular in US. Naturally it wasn't named after me but if anyone asks its very hard to say it's nothing to do with me. It has a different spelling of Bernardine (without the second 'R' that fools everone anyway) but Hey! who am I to be picky! This weekend I'm away to the Southern Writers Conference at Earnley near Chichester. It's also near the Witterings where Keith Richard has a beach hut. Really must go looking this time, I could pretend to be power walking??? He's one of my real favourites. So long as Keith Richard is being silly falling out of trees and snorting his dads ashes (allegedly) then IMO all is okay with the world. Writing is a very solitary occupation so its really good to catch up with other writers. Will gice a list and links (stop laughing) when I get back. last year was a nightmare journey... baking hot weather and accidents on the M25 both going and coming back that caused miles of tailbacks. Took over 6 hours each way. This time I'm going prepared and using the minimum of motorway. I'd sooner poodle around the back roads than be static on a motorway! 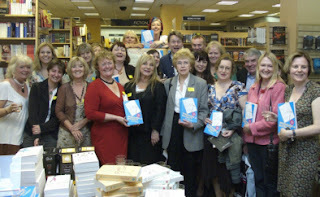 I've found a good pic of Jane Wenham-Jones' book launch (wannabe a writer?) I'm still at the back (of course) but with a face showing! Many of these smiling faces will be at the RNA conference in July. Look out Leicester University. Think you can enlarge using the mouse??? Feedback on PAST CHANCES has been good so fingers crossed for the paperback in October. I know, I seem to say 'fingers crossed' all the time but writing is so unpredictable. It takes a lot of work and a lot of fairy dust to get a book out there! Weather is lovely out there today where I am not... sadly I have to stay indoors with my face to the wall and work demonically for the next few days if I'm to be allowed to go and play 'hunt Keith Richard' at the weekend!! I wanted to change the world but life got in the way.